This ideas is focusing on the possibilities to use the concept of “Reward substitution” to improve education. The key concept of reward substitutions is the following; when you place a short term salient reward it changes how people discount future rewards. Basically that you are more likely to play Xbox now than to study for a test, far in the future. We would like to test if we can bridge the gap between effort and reward in education. Usually it could be around 10-20 years (from preschool) to a working life where the students receive the actual reward for their tedious labour in education. Last year in the US there was around 3,030,000 highschool dropouts during 2013, which potentially makes this a serious issue for the future. Even though the trend is somewhat declining this is still a large number of students left behind. This idea is based on research from when humans are offered the choice between rewards available at different points in time and that the relative value of the options then are discounted according to their expected delays until delivery. This could be compared to a preschool setting where the “real” reward for studying (perhaps a job or a successful career) is delayed so long in the future that the short term rewards often is selected since they look more salient, for instance playing Xbox (or Playstation) right now. In research it is found that human decision makers is: “torn between an impulse to act like the indulgent grasshopper and an awareness that the patient ant often gets ahead in the long run”. The (human) “preferences seem to reflect a competition between the impetuous limbic grasshopper and the provident prefrontal ant within each of us.” (2004, McClure, Laibson, Loewenstein, Cohen). By setting up a large scale behavioural experiment we could test how to get students and pupils to choose the “ant” lifestyle instead of the grasshopper by trying different experimental approaches within education. 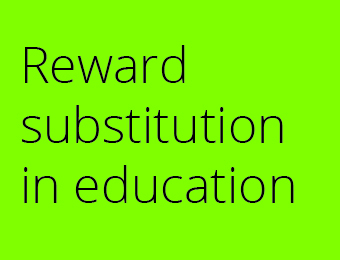 The possibility with reward substitution is huge, where educators could be able to build a personalized scalable system with technology in order to make students focus more on their studies and be more successful in education instead of giving in to the short term rewards that we as humans are prone to do. Before we abandon our current educational systems this of course needs to be tested. An experiment could be conducted over multiple randomly selected schools over a longer time frame and the students results could be monitored from preschool all the way to a working career. The students in the test groups could be rewarded with a personalized salient reward (tailored to their interests) very close to every crucial point in their education, in order to see if this increases their performance. We could also test if social norms and peer pressure translated into a digital dashboard for different (multiscreen) platforms with a real-time updated leaderboards and stats about the personal performance to see if this could be a more motivating choice architecture. If the study turns out according to the hypothesis and we can create better students by using reward substitution in education, this could have great implications for how we design future educational systems. If we can create a system to motivate students in the short term to perform better over many short term periods, we can create better educated students well suited for a future in the knowledge economy. (2004) Separate Neural Systems Value Immediate and Delayed Monetary Rewards. (2013) StatisticsBrain High school dropout statistics.